Quite a while ago a placed a poll on the Vuurmuur Wiki, asking for the most important feature Vuurmuur needs. It turns out most people want traffic shaping. Traffic shaping has been on my todo list for a long time, but i never really got into using it, let alone understand it enough to integrate it into a GUI. So the last couple of days i had some spare time, and i have been checking it out. So far i am distinguishing the following types of traffic shaping. First there is simple priorization: my VoIP/Gaming traffic should have priority over people up- and downloading ISO images. This is quite simple, and could be done using setting the ToS and creating some rules for that. In Vuurmuur, setting ToS could for example be done in a service. Second, there is some more advanced priorization, with soft limits. This could for example be used in a situation where you say VoIP/Gaming should have a guaranteed bandwith of 20kb/s, but if on VoIP is active or not using the full 20kb/s, other traffic is allowed to use the 20kb/s in addition to the other bandwidth. Most important here is to keep interactive traffic responsive. Third, the hard limits. For example saying that p2p should never be able to use more than 40kb/s, no matter how many bandwidth you have available. This could also be useful for assigning speed limits to specific hosts, for example in hosting companies. Fourth and last, there is some misc stuff for which shaping can be useful, like limiting the rate of SYN packets, giving smaller packets priority over larger, etc. This creates a htb root qdisc, which defaults to class 1:30. Here we create the class, where we define the max speed of this class to be MAX_PPP_UP. Here we define the actual limits. The first rule gets 100kbit guaranteed, but as a ceiling of the maximum speed. It has the highest priority. The second class is for bulk uploading, and it is set to about 70% of the maximum upload speed. With this set, i can upload at about 40kb/s, and still have a ping of around 80-100ms, while setting this higher will cause it to go into the 200+ms levels very quickly. I’ve also disabled burst for this class, because i don’t want ping spikes. The other two have hard limits, and can be used to really rate limit some traffic. So this way all traffic related to the SIP VoIP connection (the RTP stream) gets into the highest priority class. This is all egress shaping, the only shaping that works well, or so everyone says. Ingress shaping is not as easy, for a number of reasons. First, we have no real control over the rate of traffic being sent to us. 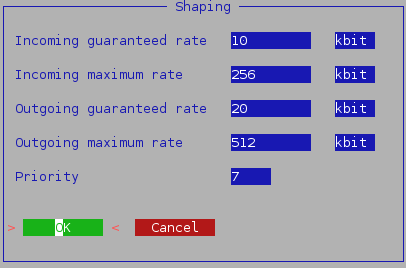 Second, linux shaping is not as advanced for ingress shaping as it is for egress shaping. IMQ and later IFB have been invented to deal with this, but i have never looked at it yet. However, in a gateway setup, egress shaping can do all we need. Traffic that comes in on my ppp0 interface, gets out on my eth1 interface. At this eth1 interface we can do egress shaping for incoming traffic coming in on ppp0. This about sums up my first attempt at understanding and using traffic shaping. So far i think it works very well. The next big question will be how this can be integrated into Vuurmuur. If i get some ideas about this, i’ll post them here. Oh yeah, if anyone is interested in participating in this process, i have setup a page on the wiki to help determine what we want and how we want to do it: here. Feel free to add to it, edit, etc.